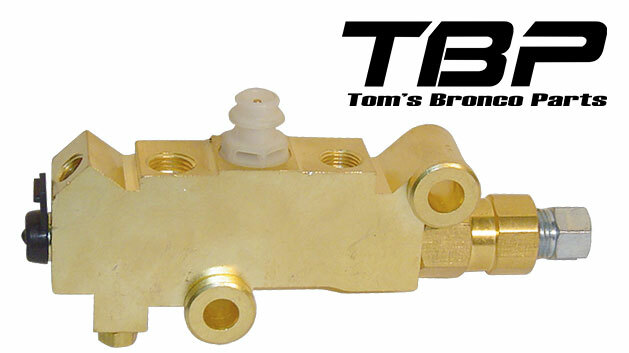 TOM'S BRONCO PARTS EXCLUSIVE! This ULTIMATE Power Brake Conversion Kit for Early Broncos w/4-wheel DISC Brakes is a New 9" Dual Diaphragm Power Brake Booster for maximum braking performance. We feel this is hands down the best power brake booster conversion on the market. Conversion kit includes a new push rod, bracket, booster, master cylinder and brake lines. 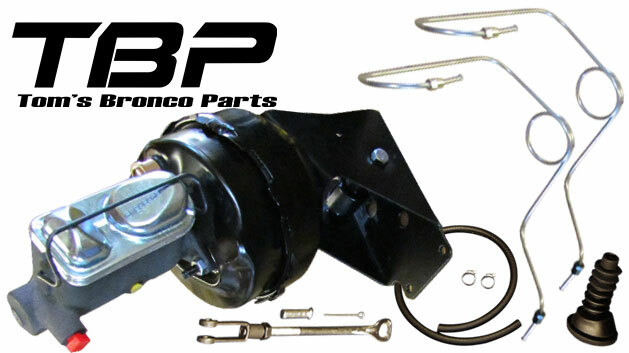 This is the ONLY Power Brake Kit for 66-77 Ford Broncos with a 9" Dual-Diaphragm Booster! NOTE: Unlike other Power Brake Kits on the market, this brake booster conversion includes a 9" Power Brake Booster, utilizing our Exclusive Power Brake Bracket this kit generally clears the fender well without modification, but may require a very small dimpling of the wheel well on occasion. Plain and simple, it's awesome! Thanks Jake. This 9" booster along with the larger bore Master Cylinder and proportioning valve has solved my braking problems. This system replaced the previous 7" booster which I could never get to work properly. I had to slightly modify to mounting bracket holes to fit the new booster. 9 inch booster bolts have about 1/4" wider centers. It barely clears the inner fender. Also my 351 Windsor oil dipstick on drivers side of engine is a tight fit but is OK. The brakes now feel similar to my 2007 Mustang GT. I use a clump of modeling clay on the high point of the booster and the master cylinder and close my stock hood to check clearances. I have about 1/2" clearance at each point.